The Vatican has adduced reasons why the Catholic Pontiff, Pope Francis recently paid an unscheduled visit to rehabilitation home for some 20 former prostitutes in Rome, reports ITRealms. The women, ITRealms gathered were rescued from their brothels and are now on sheltered protection in a cottage run by a Catholic charity in the Roman capital, Italy. 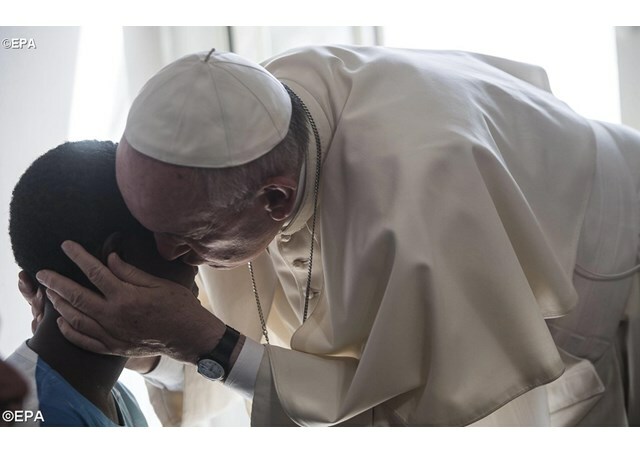 A report by the BBC.com quoted the Vatican source as saying that the impromptu visit to the cottage under the term “the Pope’s Fridays of Mercy”, focused on communities that have experienced suffering. Also, Vatican said the pontiff conversed with the women for over an hour; who were trafficked from Africa and other parts of developing countries into Europe, comprising seven Nigerians, six Romanians and four Albanians, and listened to their stories of forced prostitution. Other three in the group came from Italy, Tunisia and the Ukraine. They were all aged about 30 and had “suffered serious physical abuse” and now lived under protection, the Vatican said.